This story was originally published March 3, 1997. Actually, it was cold, windy and overcast. But Bishop John M. D'Arcy's sunny disposition Sunday was understandable. More than three years after a lightning bolt took St. Mary's Catholic Church away, more than 100 parishioners gathered with D'Arcy and their pastor, the Rev. Tom O'Connor, to break ground on the new St. Mary's. A white paint outline in the grass and mud at the corner of Lafayette Street and Jefferson Boulevard showed where the walls of the new $3.5 million church will go. 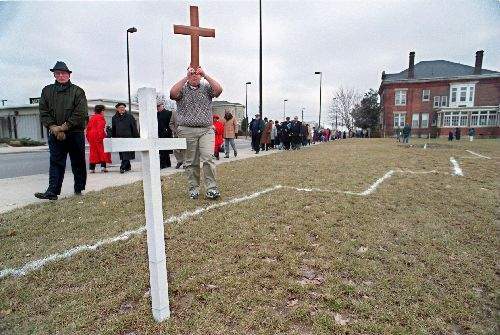 D'Arcy, bishop of the Fort Wayne/South Bend Diocese, dug out the first shovel of dirt near a white cross planted where the church altar and rectory will stand. ``This is a day of great joy,'' said D'Arcy, who gave thanks for the ``surge of interest and love and protection from people of all religious faiths'' that poured in after the Sept. 2, 1993, fire sparked by lightning. For members of the St. Mary's congregation, the groundbreaking was a moment they had been anxiously awaiting. ``I never lost hope, but it's been a long time,'' Rosemary Mausser said. Perhaps the happiest person in the crowd was Thelma Shulte, the church's longtime business administrator. After the fire, Shulte spent months working in the church office just east of the burned-out church shell - then years working next to the empty field that remained after it was demolished. ``I was about ready to get a shovel and start digging myself,'' Shulte grinned. Congregation member Barbara Jones, a member of the church's building committee, said she understood the frustration of her fellow churchgoers. But the road to the new St. Mary's first had to get through a lengthy insurance negotiation, then planning and design. Before the groundbreaking, D'Arcy celebrated Mass with the St. Mary's congregation in their adoptive home at St. Paul's Catholic Church, 416 W. Washington Blvd. The bishop thanked the St. Paul's congregation for opening their doors to fellow Catholics in need. He also praised O'Connor, who received a standing ovation, for keeping the congregation together under adverse conditions. ``Tom, I think the congregation has actually grown while in exile,'' D'Arcy said. Construction on the 12-15 month project is expected to start in mid-March, weather permitting. The new church building will be much larger - about 23,000 square feet compared to about 12,000 for the previous church. However, the chapel itself will be much smaller - seating about 275 instead of 1,000. The smaller worship area, which was mandated by D'Arcy, shouldn't be a problem for the congregation. Before the fire, the only time the chapel came close to filling was on Christmas and Easter, parishioners said. Usually, St. Mary's drew about 275 people, combined from two Sunday services, leaving the cavernous church feeling empty. But the bigger building means there is room for features the previous church was sorely lacking: meeting rooms, classrooms, office space and extra storage space for the St. Mary's Soup Kitchen. The breathing room is needed; conditions were so cramped before the fire that the religious education classes had to rent space at St. Patrick's Catholic Church. The new church's $3.5 million price tag will be easily covered by the $6.6 million insurance settlement and more than $290,000 in community donations. What remains of the insurance settlement will go to an endowment fund to help the poor and needy throughout the diocese. Although D'Arcy had always said St. Mary's would be rebuilt, he said some in the diocese were against it because of the dwindling numbers and suggested dispersing the congregation. D'Arcy said he made the right decision because of the church's community work.